Louisiana road demons, GOATWHORE, will take to the streets again later this week on an epic North American headlining tour. With support from Ringworm, Black Breath and labelmates, Theories, the lengthy trek will devour three-dozen venues beginning June 5th on their home turf of New Orleans and coming to a close on July 12th in Atlanta. The latest run follows the band’s recent Australian and European onstage demolitions. Tickets are on sale now through all local ticket outlets. 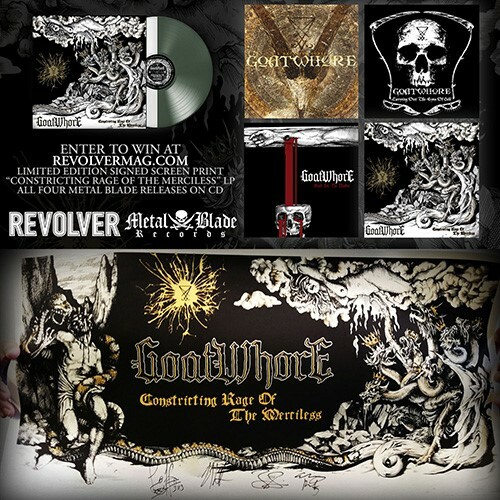 In celebration of GOATWHORE‘s latest bout of live debauchery, Revolver is giving away a limited edition signed screen print of the band’s stunning Constricting Rage Of The Merciless cover along with the band’s four Metal Blade releases – Constricting…, Blood For The Master, Carving Out The Eyes Of God and A Haunting Curse – on CD. Enter to win NOW at: revolvermag.com. In related news, GOATWHORE will be compiling live footage from the upcoming tour for a new video for the fan-favorite track, “FBS.” If you’re attending show on this tour (or have footage from previous tours) and you capture any video on your mobile device, post it to youtube and send the link to goatwhorevideo@gmail.com. Your clips could be featured in the brand new video and your YouTube channel credited in the final video’s description! 07/09 Rock & Roll Hotel – Washington, D.C.
Additionally and in conjunction with the tour, iTunes will be launching a special GOATWHORE sale. Each of the band’s four Metal Blade-issued full-length will be available for a cool $7.99 from June 5th through July 13th. GOATWHORE will be touring in support of their critically-adored Constricting Rage Of The Merciless full-length, unleashed last July via Metal Blade Records. The record debuted at #81 on Billboard’s Top 200 chart, toppling their last entry position of #171 with Blood For The Master. Additionally, the record hit the #21 spot on Billboard’s Rock Chart, #7 on the Hard Rock Chart, #13 on the Independent Chart and, boasting ten mutinous tracks of thick, predatory, subterranean metal, continues to reap the exaltation of fans and critics globally.